There were a lot fewer people waiting in the waiting area this time. Wednesday and Thursday are for new OB appointments. They actually take their time with patients and explain things in a little more detail. There was one daddy in the waiting room other than me. He had headphones in his ears and was listening to something that appeared to be absolutely hilarious. His pregnant partner didn't seem amused. I have a feeling he's starting this journey out on the wrong foot. The receptionist gave my wife a stack of paperwork to fill out while we waited. They called her back just as she was completing the last page. The receptionist told the nurse to wait. I stood up. I sit back down. Karyn said "I'm done." I stood back up. The nurse disappeared. I sit back down. The nurse reappeared. I look like I'm dancing. We went back into that familiar hallway where pee cups are given and husbands are herded. On to the back waiting area while our room is being sterilized. At least I hope that's what is taking place. We ended up in room 3. We're finally almost to the point where we get an ultrasound! Woot. It's been almost a week since we were last here and we thought we were going to get a glimpse into the womb last time. It's been a long week to say the least. Sleep has been hard to come by at the Smith house and we know it's only going to get worse. Our ultrasound lady's name was Cindy. She had Karyn lay back on the table and we got started. She fumbled around for a moment and asked "Do you guys see what I see?" I did. I instantly said "TWINS???" Karyn looked at me in disbelief. Cindy said "Yep. Twins. There's two of them in there!" Wow! Talk about a flood of emotions. I laughed a nervous laugh and I saw a few tears trickle down Karyn's face. She was genuinely scared. I leaned over and gave her a kiss and told her everything would be ok. We can do this. Cindy took several pictures and handed them to me. She said that the babies are on top of each other right now and that's normal. She's about 8 weeks pregnant. She checked out everything else that needed checking and told Karyn to get dressed and come outside. We went out and the news had already spread across the office. All the ladies working there were peeking around corners, smiling. They seem to still get pretty excited over twins. TWINS. 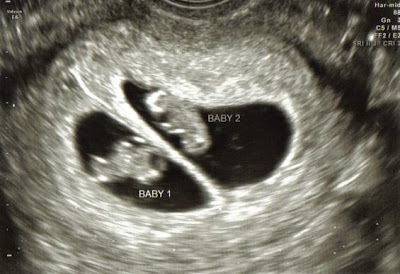 That's pretty incredible to say that you're expecting twins. The picture shows that they're fraternal twins since they each have their own living quarters. I'm kind of glad they're not going to be identical. With four kids, we're going to be exhausted and probably easily confused. Of course we shared the news with all of our friends and family as it was happening and both of our phones were blowing up in the doctor's office. The nurse told us we may want to wait a couple days to let it sink in before sharing with everyone. Too late. The support has been incredible and that's so important. We're going to need all we can get. We both went on to work after the appointment. In hindsight, I should have taken the day off. I couldn't focus on work. Everybody stopped by my desk, emailed, called, etc. I couldn't think about anything other than the twins. I stopped at lunchtime and closed my eyes. I said a prayer for God to give me the guidance I need, the comfort Karyn needs, and for Him to look over the babies as they grow. I called mom's house and told Isaiah. He said "Nuh uh!" My mom said the look on his face was priceless. I can only imagine. I called J's school and told him. He said "Whaaaat?" I think they must have been just as shocked as we were. Still are. I'm scared, nervous, excited, impatient, restless, and happy. Really happy! What a blessing. We've been blessed with an opportunity to raise twins. That's a pretty rare thing. We're still hoping one of them is a girl but understand it's not up to us. Whatever God decides is best for us. We'll just give all the love we can split up over 4 kids. Have I mentioned how much I love my growing family? I really do. I kept the ultrasound picture at my desk all day and carried it in my shirt pocket when I left my desk. I didn't want to miss the opportunity to share our great news. We're going to need 2 of everything. Car seats, strollers, Vols outfits. So when you pray for our family, please pray twice. We thank you. We thank you.